This is a fantastic space opera: I read it last year, and greatly enjoyed it. It’s also been nominated for just about every SF award out there. 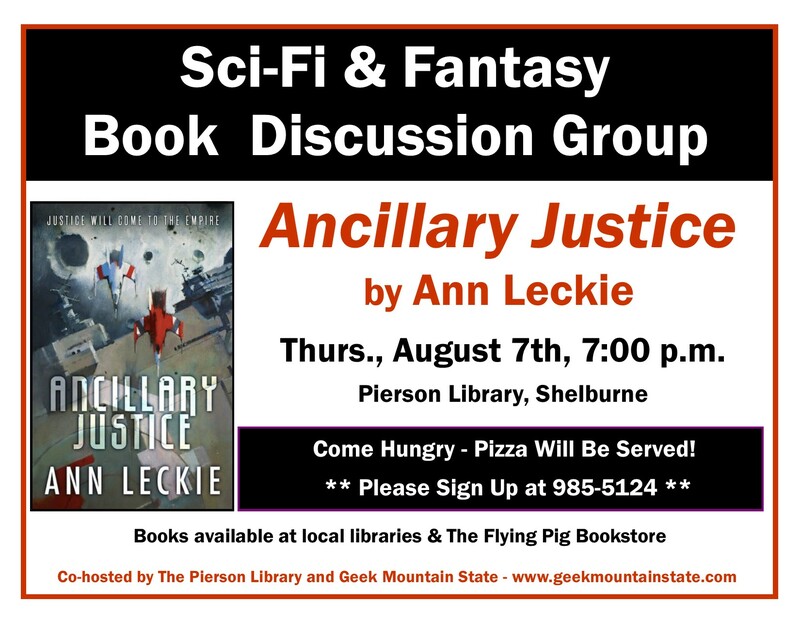 Come join us on August 7th, at 7:00pm at the Pierson Library in Shelburne. RSVP here. Our next book club will feature The Emperor’s Blades by Brian Stavely, which will be on July 1st at 7:00pm. Our next book club meeting is coming up on June 5th. This time around, we’ll be reading and discussing James S.A. Corey’s debut novel, Leviathan Wakes, the first book of the Expanse series. The Expanse is a much buzzed-about science fiction series, taking place within our solar system as a hijacked space ship and a missing girl lead the various governments in the system to the brink of war, with consequences that can affect everyone. The novel has been picked up for television adaptation by the SyFy channel, written by Vermont’s own Hawk Otsby. If you’re interested in attending, please RSVP to the event (we’ll provide pizza!) here. In the meantime, pick up the book and give it a read (it’s long, but fast) and come prepared to chat about it in June! We’d like to note that it’s probably best to buy this locally – Amazon.com is currently engaged in some strong-arm tactics against Hatchette, the book’s publisher, and is only shipping the book after a couple of weeks after it’s ordered. Barnes and Noble and local book stores should have it in stock or be able to get it quickly. Last night, we held our first SciFi book club at the Pierson Library, where we discussed Andy Weir’s The Martian. 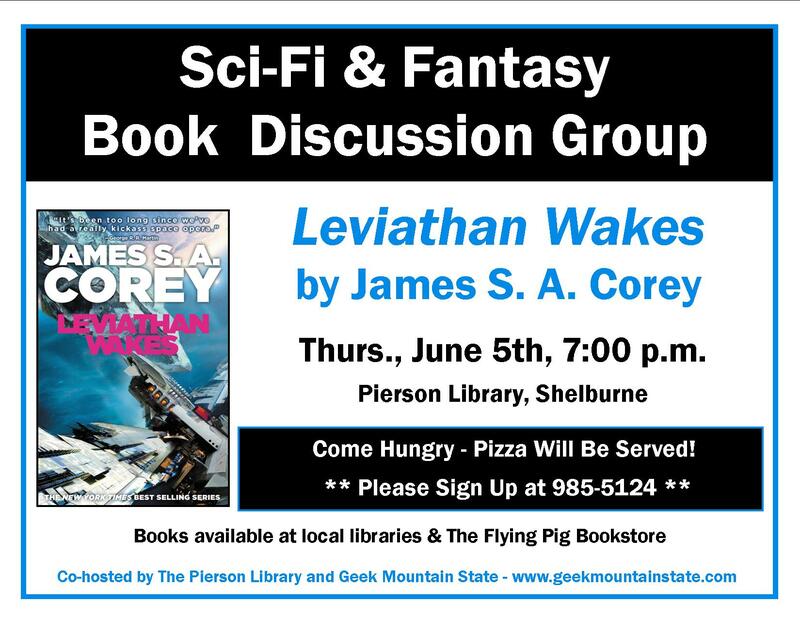 We had a good discussion, and now, we’re looking forward to our next meeting, in which we’ll discuss Leviathan Wakes, by James S.A. Corey! The meeting will be on June 5th at 7:00pm. Grab a copy of the book (available at a lot of local bookstores), and come out to chat with us about it. Personally, I can’t recommend this one enough – it’s a fantastic, solid SF read. We’re starting up a book club, and we’re pretty excited to get people together to talk about SF books. 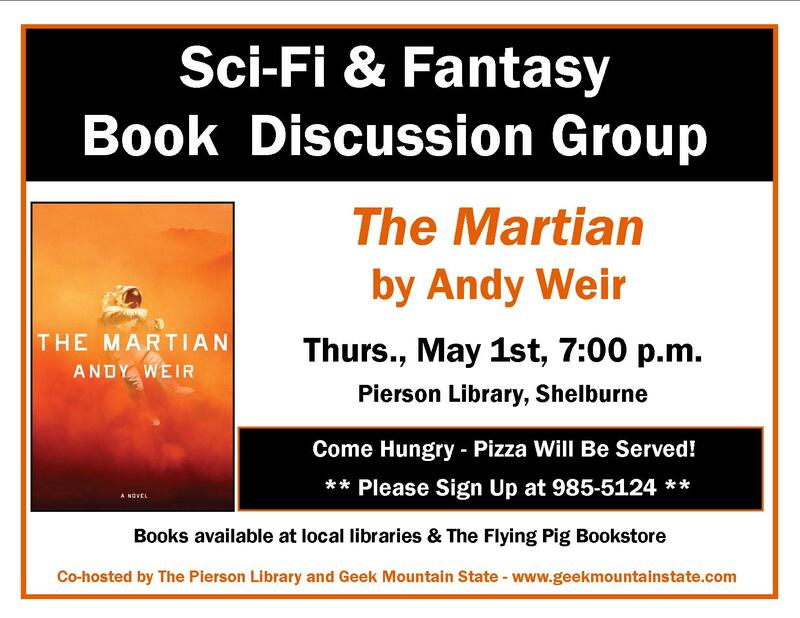 Our first meeting is tomorrow, May 1st at 7:00pm, to discuss Andy Weir’s novel, The Martian. We’ll have pizza on hand for guests! RSVP here. Announcing the GeekMtnState Book Club! We’re set to launch our next line of events through Geek Mountain State: the GMS Book Club! We’ve got a ton of readers who follow us, who’ve attended our reading events, and we figured that this would be a great way to get some of them together and chat about some of the more recent releases. We’re partnering with the Pierson Library of Shelburne, which will host the series. The general plan right now is to meet on the first Thursday every month at 7:00pm. The first meeting will be on May 1st. Food will be provided! Kaden, the heir to the Unhewn Throne, has spent eight years sequestered in a remote mountain monastery, learning the enigmatic discipline of monks devoted to the Blank God. Their rituals hold the key to an ancient power he must master before it’s too late. At the heart of the empire, Minister Adare, elevated to her station by one of the emperor’s final acts, is determined to prove herself to her people. But Adare also believes she knows who murdered her father, and she will stop at nothing—and risk everything—to see that justice is meted out. Vermont-born author Emily Raabe will be releasing her first novel tomorrow, April 8th, titled Lost Children of the Far Islands. The book is described as a middle-grade adventure novel, and has received good reviews already from places such as Kirkus Reviews. Twins Gus and Leo and their little sister, Ila, live a quiet life in Maine—until their mother falls ill, and it becomes clear her strength is fading because she is protecting them from a terrible evil. Soon the children are swept off to a secret island far in the sea, where they discover a hidden grandmother and powers they never knew they had. Like their mother, they are Folk, creatures who can turn between human and animal forms. Now they must harness their newfound magic for a deeper purpose. The ancient, monstrous King of the Black Lakes will stop at nothing to rise to power, and they are all that stands in his way. Their mother’s life hangs in the balance, and the children must battle this beast to the death—despite a dire prophecy that whoever kills him will die. Can Gus, Leo, and Ila overcome this villain? Or has he grown too strong to be defeated? Lost Children of the Far Islands is a story filled with magic, excitement, and the dangers and delights of the sea. Emily Raabe is one of the Flying Pig’s favorite people: she was our first employee and a marvelous writer. Now, her debut novel for children is being published. Woo-hoo! Shortly after reading an early draft of the manuscript for Lost Children of the Far Island, we found ourselves starting to recommend it to a customer — two years before it was published! That’s how terrific and memorable the story is. Here’s a little teaser about the plot: when their mother takes ill, three siblings must accept their magical, shape-shifting powers to try and save her. Part Selkie myth, part fantasy, part quest, this book is a natural for young readers. Gorgeous writing and a tight plot that can leave you breathless, Lost Children of the Far Island is a book we cannot wait to offer to customers. We couldn’t be happier to host the book release party for Emily! Come help us celebrate at Shelburne Town Hall (right next to the Pearson Library in Shelburne Village). Emily will share a little of the book, host a Q&A session, and autograph and personalize books. We’ll have refreshments, too; it’s a party! 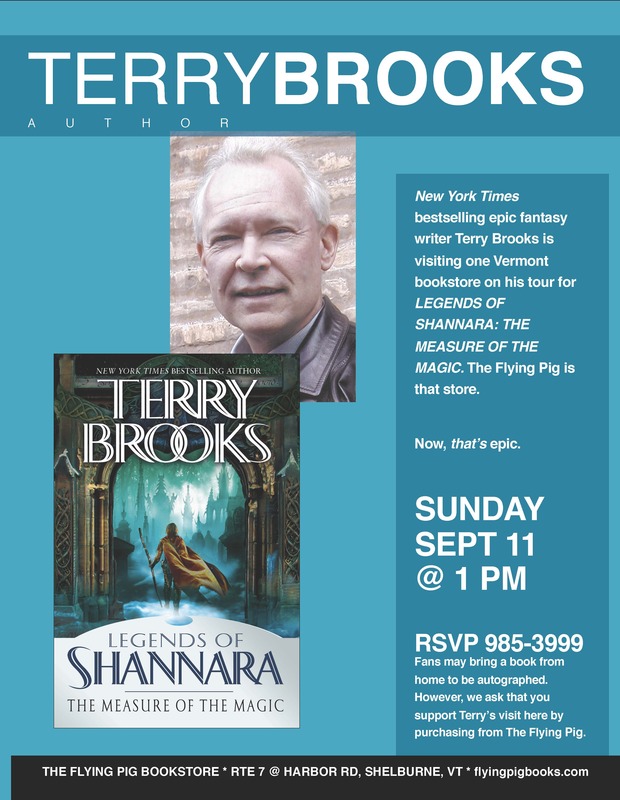 Please RSVP with the number of people attending, by calling 802-985-3999 or emailing at flyingpigevents@gmail.com. This looks like it’ll be a neat book, and a neat event. Go follow Emily on Twitter. Maker Faire Bay Area 2012. Photo by SparkFunElectronics.